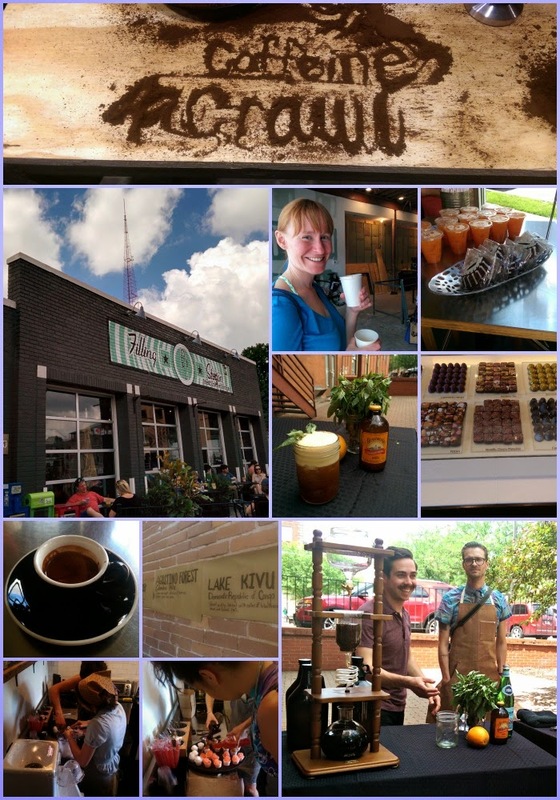 It's been awhile since I blogged about my own back yard, but today is changing that with a recap of the Spring Caffeine Crawl (hurry, there might still be tickets left for tomorrow here). I had heard about this last fall but it was sold out already; when I saw the ad for it in my weekly Yelp email, I sprung into action for tickets. You have the option to attend via bike or bus -- we opted for the latter -- and there are two days worth of "crawls" visiting different places around the city. Our route included - Shang Tea, Christopher Elbow, The Filling Station, Quay Coffee (pronounced 'key' if you want to sound in the know), Little Freshie and Crow's Coffee (not even open to the public yet). The best part about the crawl was that it was more than a string of drip coffees (like I had anticipated). Instead, we had a sampling of teas, protein balls w/crushed espresso beans and chocolate chips, coffee mocktails, caffeinated snow cones, chocolate and espresso shots. Despite a few downpours, it was a perfect morning activity. The organizer of the event, The LAB, has similar crawls across the country, so look for one near you - the next one in KC is in November and it will sell out fast. Thanks for stopping by the blog!